Born in Shibata City, Niigata Prefecture on August 22, 1961. '81 Entered the Department of Cinema, College of Art, Nihon University. Began a music unit named VIZION, with Kenjiro Sakiya, who had joined the Department of Music in Nihon University concurrently. Played the guitar with this unit. Later, came up with the synchronization of MTR and live performance at concerts, and started engineering activities. Launched own business after working for TVCM production firm, record label, etc. '90 Founded a music production and publishing company named "AND MUSIC LTD."
Started music activities on a full-scale. Early 90s Worked also as a film maker for documentary programs and music videos. Pursued both 'film for music' and 'music for film'. 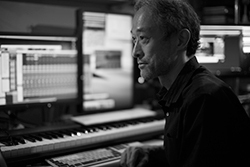 '96 Undertook the composition of film music for "Moe No Suzaku" directed by Naomi Kawase. '97 "Moe No Suzaku" received the Camera d'Or Award at Cannes International Film Festival. Since then on, engaged exclusively in music composition. Concentrated in composing mainly music for films used in movies, television commercials, etc.